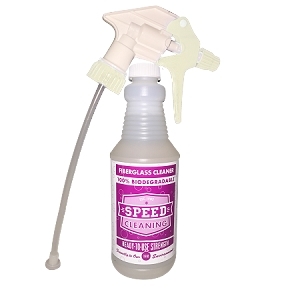 We started our long search for this product when we could no longer stand the irritating fumes of retail liquid cleaners. 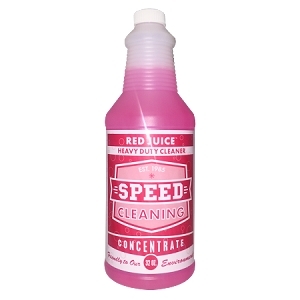 With Red Juice we got a powerful, biodegradable, odor free, personally safe cleaner--and even more! To start with, the degreaser in Red Juice is made from user friendly and environmentally friendly seaweed, while the degreasers in most similar cleaners are derived from petrol-chemicals. Red Juice is all natural with ingredients such as soybean extracts. Red Juice is pH neutral, non toxic, unscented and completely biodegradable. These are perfect spray bottle sizes - and they have red juice in them. I haven't found anything yet that red juice can't conquer. It was an eye opener when I read that it also worked on laundry. I have certainly been using red juice for 20 years - and probably longer. Originally saw an ad in Parade. Beyond reasonably priced and a fantastic solution to pretty much everything around the house. This cleaner is great. I cleaned a couple very dirty houses using Red Juice. Cleans well, leaves not residue. I even used it to clean the gross tile floors. And the BEST part is that it doesn't bother my asthma!!!! I highly recommend this product. I do love Red Juice. I use it for everything. Safe around food, no discussing odors, I read about using it on blood stains and it worked there, I used it on a red wine stain, again, great results. It does wonders for my very old kitchen counters. It is a really good product. Try it and see. The Best Multi Purpose Cleaner Ever! 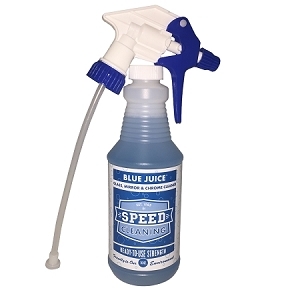 After reading Jeff Campbell's book, "Speed Cleaning" in the late eighties, I ordered the starter kit along with the Red Juice. I was such a slob, I hated cleaning, but I still wanted a clean place to live in, so I was ready to implement the Speed Cleaning rules. I still had some old brand name cleaners left over and wanted to use them up before I started using Red Juice. I noticed the front panel of my stove looked dirty and greasy after not cleaning it for awhile (hey, I was young!). I sprayed brand #1 on the grime then wiped it, it didn't even budge, even after using elbow grease. Then I used the brand #2 on it, then used elbow grease to wipe it off. Well it moved, but just barely, it still wouldn't come off. Then I decided to go ahead and use the Red Juice, I sprayed it on the grime, and then I just wiped it. It came right off with just one wipe, with no scrubbing or elbow grease. I was so impressed that I just threw out the other cleaners. One apartment I moved into, had a stove that looked like it had never been cleaned in years underneath the stovetop. It was about an inch thick of food crumbs and grease under there, I actually thought it was rust. I got out the Red Juice and the scraper, and started cleaning it out. It took me about two hours, but I finally got down to the bare porcelain or metal. The Red Juice makes cleaning a breeze! I have used the Red Juice as a stain remover for my laundry and spot clean my carpet when I spill a little food. I even use it in my carpet shampooer to clean my carpeting. It has no obnoxious odors and it is gentle on my sensitive skin. I went from hating to clean with a passion to "Hey it's not so bad to clean after all!" The Red Juice makes cleaning, and life so much easier. I am into my third decade using Red Juice in my home, and it is truly great stuff. Not only does it clean thoroughly, but it doesn't leave behind any 'drag' or sticky feeling left after wiping. It was so helpful when Clean Team told me several years ago that I could also use it on my new granite countertops. I was hesitant at first, but it continues to clean wonderfully and does no etching damage to the granite. I am always surprised by how intense the artificial odors are in other cleansers when I am out shopping. Red Juice does its hard work with no throat-catching odor left over after. Don't be tempted to add more than called for when making it up from concentrate--the pink color after mixing looks delicate, but its power is mighty. Great stuff. Red Juice Does it All! When my son got married back in June of 2014 in an outdoor ceremony, it was stormy, wet, and quite cool for most of the day. Even though the weather cleared up beautifully in time for the wedding at 5:00, the ground was wet and somewhat muddy. One of my daughters was a bridesmaid, and her mint-colored dress was floor-length, so you can imagine what the hem looked like after the ceremony. I procrastinated on cleaning the dress when I found out that the local dry cleaner would not do it professionally because of all the decorative beadwork on the bodice. In early September I finally summoned the courage to attempt the cleaning myself using the delicates cycle on my washer. Since the mud stains had been sitting on the dress for three months, I knew I had to pre-treat them before laundering. I sprayed Red Juice concentrate (along with some Shout Advanced) on the hem and waited a few minutes before washing. When the cycle was done, NOT A TRACE of the mud stains remained, and there was absolutely no damage to the fabric! That dress looked brand new and is still my greatest laundry success story! I love Red Juice, I have been using it for years. In addition to being a great cleaner I've discovered that you can spray a scary bug with Red Juice and then just wipe it away, no streaks on the wall! And I love that it is safe to use and doesn't emit noxious fumes. I absolutely love Red Juice!!! It cleans extremely well and without any nauseating odor like some all purpose cleaners. I've raved so much to family and friends, that many of them are also now using it exclusively for their all purpose cleaner. 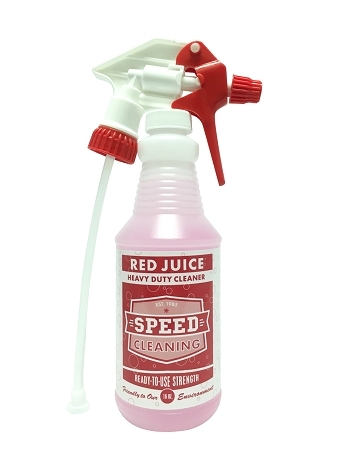 This red juice is amazing,I've used it for years in my business,love how it cuts dirt,crayon marks,black heel marks,I've even used it in shower and it cuts the grime and scum.thanks for making this product available to the public. When I want my counter thoroughly degreased and clean, this is my go-to cleaner. Not even dishwashing soap can compare to how well Red Juice works. And since it's a spray, it doesn't eat up my hands like using soapy water does. Love this stuff, but have to use it sparingly. (shipping costs). It works great everywhere else, but I think my favorite application is the kitchen. Red juice is the best. It replaces all of my cleaners. Great to get rid of stains in clothes, stove, walls ect. Red juice is the only cat litterbox cleaner acceptable to all the many homeless cats I have fostered over the years. It's great for other purposes, too, but cat likes are the best! Red Juice is our 'go to' cleaner! We have used it for years. It cleans so efficiently and there is no fear of it damaging any surface. We have a part-time janitorial service and this product replaced many products because of its versatility!!!! We highly recommend Red Juice. Can you love a cleaning product? This one you can and you will! This is the best product ever for every day use. 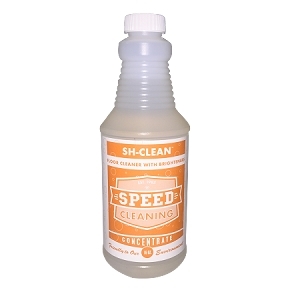 The bottle sits on my counter -- with a cotton cloth also purchased from Speed Cleaning -- and I use it throughout the day to clean-up. Safe around food. No scent. Super product! We have a vacation rental that we clean with Clean Team products and the red juice is our go to for many surfaces. It is amazing! I love that it isn't smelly and chemical but still gets the job done. This stuff can do anything! At first, I was doubtful about this Red Juice, being stingy with it and trying to use it with a wet sponge the way I do with other cleaners. But when I finally decided to do the spray-on-wipe-off method with the cotton cloths, I was amazed at how well it worked and how many different things it could do. For example, my cat always leaves a dark smudge on the corners of the doors into the kitchen, where he rubs back and forth while waiting for his food. My walls are an off-grey, and neither plain water, soap and water, nor cleanser and water could get the smudge off, and in fact trying to wash the smudge off just made it worse. But today I tried the Red Juice -- spray on, rub a bit, wipe off -- and suddenly I have no smudges and the paint wasn't hurt at all. Wow! I also had a very faint stain on a carpet where my cat had thrown up but I hadn't noticed it until days later. This is a good kind of carpet, where stains normally come up with soap and water, but this stain had really set. Red juice to the rescue: spray on, rub, wipe up, and then use soap and water and blot dry -- and I can't tell where the stain was. The stuff also works wonders on my granite countertops and my bathtub fixtures. I love this stuff! In fact, I just ordered the concentrate, because I'm sure I'll be using it a lot more in the future. I've even started carrying it and a couple of cotton cloths in my cleaning apron for on-the-go touchups when I dust and vacuum, which I never did before. I have been using Red Juice for nearly 20 years, and will not use anything else. I have gifted it to many friends, who now also use it as their only cleaner. I love how powerful it is, without any odor. I like how it is safe around the kitchen, animals and children. My children grew up with Red Juice, and now that they are adults, they continue to use it at their homes. It is also one of the most cost effective cleaners out there.